Bente Nicolaysen, who was a Fulbright Scholar from the Department of Sociology at the University of Bergen, Norway spent her six-month residence as a Visiting Fellow at the Center for the Historical Study of Women and Gender in 2003-2004 working on her dissertation, which focuses on voluntary provision for working parents in Norway, 1960-1990. She is the author of studies of voluntarism in Norway's strong welfare state. She can be contacted at Bente.Nicolaysen@sos.uib.no. 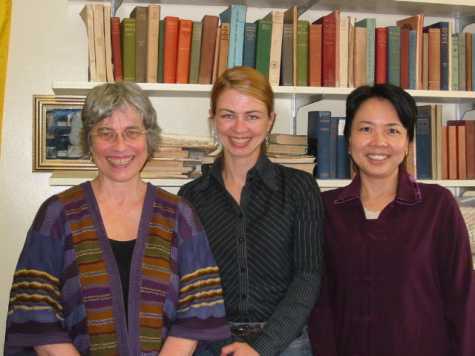 Professor Rui Kohiyama, Associate Professor of Area Studies at Tokyo Woman's Christian University joined us for the 2003-2004 year as a Fulbright Scholar and Visiting Fellow at the Center for the Historical Study of Women and Gender. Professor Kohiyama has published extensively on the history of American women missionaries in Japan. She can be reached at rui@lab.twcu.ac.jp.